Initial Gene Target Of Resveratrol Finally Identified. Over eight years after a Harvard University researcher mistakenly identified the primary gene target of resveratrol (rez-vair-ah-troll) as a survival gene (Sirtuin1) that is also variably activated by calorie restricted diets, National Institutes of Health (NIH) researchers say they have now identified an enzyme (phosphodiesterase4 or PDE4) as the first gene target of resveratrol. Specifically, this enzyme is inhibited by resveratrol, known as a red wine molecule. All of the antioxidant molecules in red wine are enzyme inhibitors. The Sirtuin1 gene is not totally out of the picture, it is activated indirectly in the gene pathway along with other important metabolic gene targets such as NAD, PGC1a and AMPK. The study, which was conducted in mice, needs to be replicated in humans. Will resveratrol be supplanted by a drug? In a health care system that financially rewards patentable synthetic drugs over natural unpatentable remedies, the fact NIH researchers prefer PDE4-inhibiting drugs over resveratrol should be expected. However, in this instance, resveratrol may be far safer and certainly more economical. The surprising element of this discovery is that phosphodiesterase inhibitors are not a new gene target for pharmacologists. There are at least a dozen experimental PDE4 experimental inhibiting drugs (Cilomilat, Arofylline, Etazolate, Mesembrine, Roflumilast, Filaminast, Glaucine, Irsogladine, others). But none of these PDE4 inhibiting drugs have gained FDA approval. The low-toxicity claim for Rolipram is incongruent with the fact this drug has long been known to cause headaches, nausea and vomiting which has severely restricted its usefulness. Manufacturers of PDE4-inhibiting drugs have resorted to making topically applied drugs to avoid these side effects. 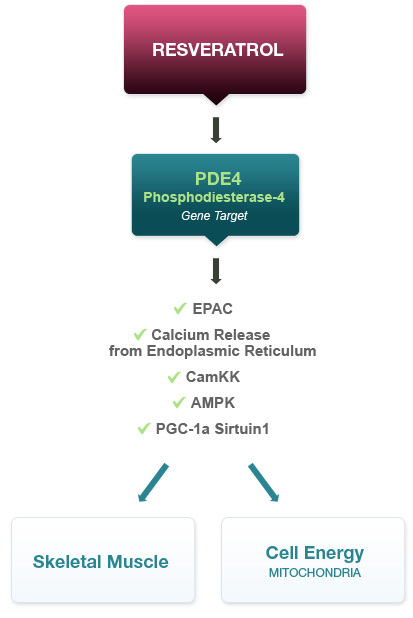 Furthermore, rodents are not an ideal model for the study of PDE4 inhibitors because the amount of PDE4 activity in human hearts is five-times that of rodents. The mice in this study were fed a high-fat diet and received the human equivalent of 1400 milligrams (20 milligrams per kilogram/2.2-lbs of body weight) of resveratrol (calculated for a 160-lb/70 kilogram adult). That dose would be equivalent to consumption of over 1000 bottles of wine. However, it has already been widely demonstrated that relatively low doses of resveratrol, but above that provided in the diet, can produce profound health benefits in humans. The dose in this animal study is impractical and misleading. Toxicologists usually want a wide margin between the dose that produces no observable side effects and the lowest dose that produces a measurable side effect. In a prior mouse study, a dose of Rolipram as low as 30 milligrams per kilogram (2100 mg human equivalent) of body weight produced inflammation and scarring of the heart, liver problems and precancerous changes stomach. Excessively high doses of resveratrol are not necessary to produce beneficial effects. Phosphodiesterase-4 inhibitors are very anti-aging promising anti-aging agents that have been shown to address many of the maladies of aging and have been demonstrated to restore lost memory due to aging, calm the inflammation of arthritis, helps to slow age-related loss of bone, alleviate high blood pressure and arterial disease, improve circulation to the back of the eyes, treat tumors, overcome the effects of strokes, and alleviate lung-associated breathing problems. Resveratrol, as a relatively safe PDE4 inhibitor is positioned to live up to its calling as a true anti-aging molecule.